The story of the New River and the entrepreneur, Hugh Myddleton, who brought fresh water to London in 17th century England. True story of a man who took a life and saved a life brought into the modern day by our Children’s and Youth theatre. The story was brought to us by the Pearly Queen of Bermondsey stating “everyone knew Pedlar Palmer, the boxer that killed someone on a train, but no one knows he saved my life in Hoxton in the 1930’s”. Using this pearly story we have explored issues around at this time that are still present today, such as the media, celebrity status, fame and how one persons life can be transformed and tarnished forever. The story of Collins Music Hall at Islington Green and the tale of its creator Samuel Collins - 'Vagg'. During the day Samuel Collins spent his time sweeping chimneys and was known to locals as ‘Vagg’. But at night he would tour public houses and eventually gained a licence to turn the Lawnsdown Arms into what became known as Collins Music Hall. An epic tale of a professors experiment that went wrong. This play explores the environment and young peoples' attitudes towards climate change in the 21st century. 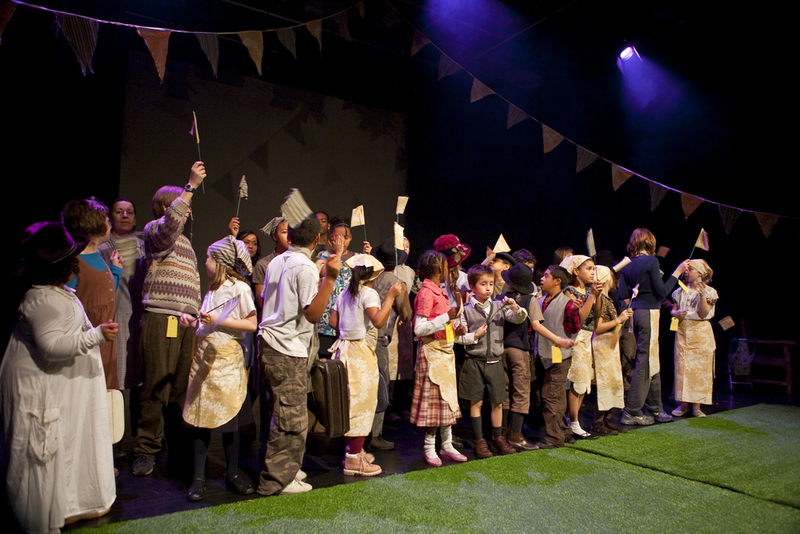 This is a play inspired by the evacuation of children from London during the second world war, finding themselves in strange lands full of adventure and tragedy.